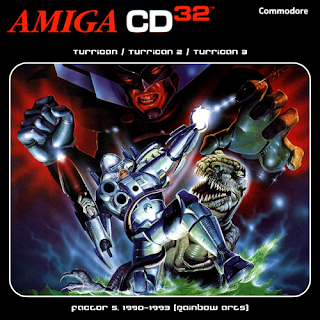 This compilation includes all three Turrican games released for the classic Amiga on one disc for use with the CD32 (the CDTV versions of Turrican & Turrican 2 have been excluded). The Turrican series was Factor 5's most sucessful franchise, and to this day they remain as popular as ever across a wide range of platforms. It's interesting to note that adverts for Turrican 3 state that a CD32 version would be 'available soon', although it sadly never materialised. Considered by many to be the weakest game in the series, it would be interesting to know whether or not the CD32 version had any extra features planned (AGA enhancements, extra levels, CD audio, etc.) - or perhaps even if an official compilation would have been viable for the console. 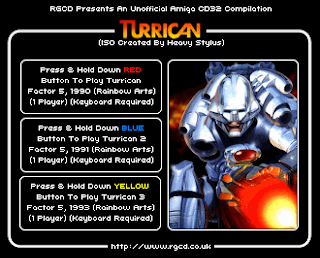 Unfortunately, all three games require some keyboard input (the main culprit being the high score entry, and Turrican additionally requires the 'Alt' key to fire grenades) - but they are still playable (to a degree) without one. Over the years there have been many remakes and modern day tributes to the Turrican series (not forgetting exclusive Super Turrican games on the SNES), but in our opinion nothing beats the frantic pace and game-play of the Amiga versions. 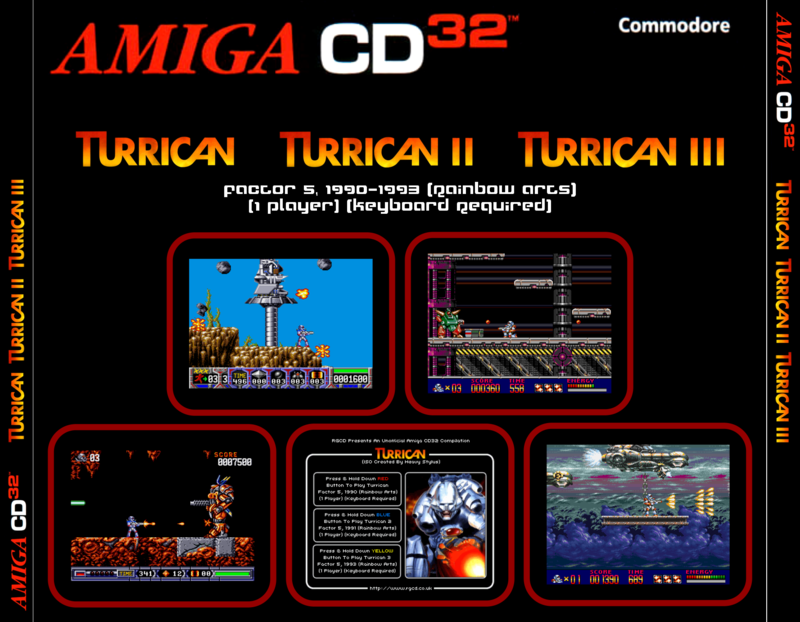 This compilation will certainly make buying a keyboard for your CD32 worthwhile. Don't you need spacebar for the weapons/gyroscope too or is that remapped to the CD32 pad? 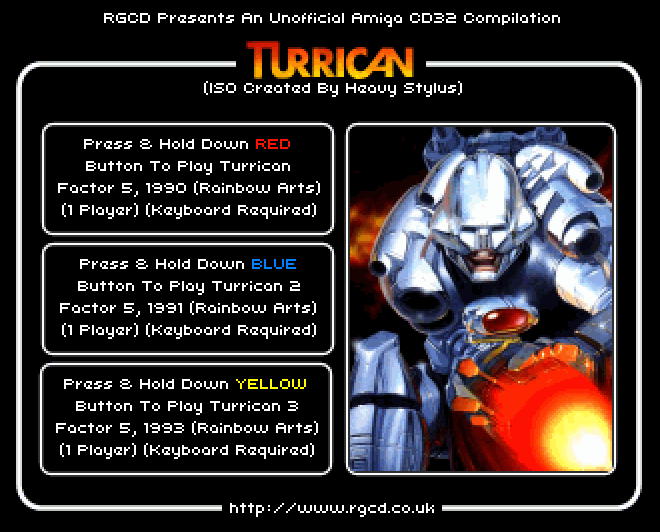 The Turrican games actually support two button joysticks anyway (blue on the CD32 pad), so it's just the grenades and hiscore that cause a problem. can't the grenades be remapped to one of the numerous buttons on CD32 controller? Superior artwork jobs on these CD-32 game covers ! Thanks a lot for making them available here together with the games!